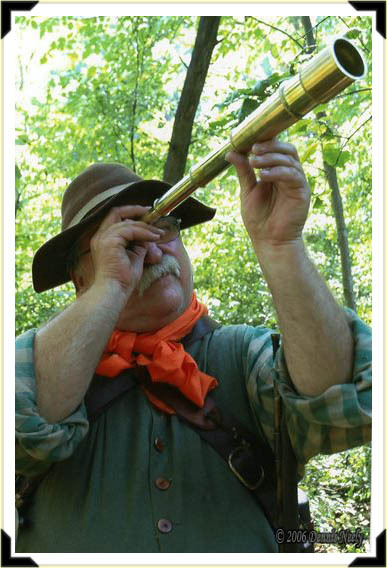 While sitting in camp, a British hunter from Fort Detroit reached for his haversack, pulled out a brass telescope and looked to a far hill. “I thought I saw something over there,” Fred Tonks said as he compressed the wilderness treasure. A half-day’s journey west of Fort Detroit, 1763. This entry was posted in Hunting Camps, Snapshot Saturday and tagged Black powder hunting, Dennis Neely, historical trekking, North West trade gun, Northwest trade gun, trade gun, traditional black powder, traditional black powder hunting, traditional blackpowder, traditional blackpowder hunting, Traditional camping, Traditional Woodsman. Bookmark the permalink.